I am intrigued by the diversity of exaggerated traits displayed by males across the animal kingdom. I have been exploring the role of sexual selection in driving the evolution of these traits in a number of arthropods including the New Zealand giraffe weevil and more broadly in brentine weevils, Opiliones (harvestmen), and anthribid weevils. I’m currently exploring weapon diversity in a group of NZ harvestmen with extremely exaggerated chelicerae (jaws). The males of this fascinating endemic group use their chelicerae as weapons during fights and most interestingly we have identified multiple weapon forms and function within a single species. Understanding the evolution of chelicera exaggeration and in weapon diversity in general is the goal of this project and we are using a range of techniques including 3D modelling using microCT x-ray reconstructions and phylogenetic least squares analysis. Much of my PhD research was based in the field undertaking extensive observations of the mating and fighting behaviour of the New Zealand giraffe weevil (tuwhaipapa). This species shows incredible size variation among individuals and this (and the huge amount of competition between males) has likely driven the evolution of alternative mating tactics including sneaking and fighting. Males fight aggressively for females and I am interested in the assessment strategies used in these contests as well as figuring out how small males make decisions on whether to sneak or fight in any given interaction. I’m also interested in identifying variation in sexual selection on rostrum size in giraffe weevils and am looking at how this varies with density, latitude, and body size. I’m currently launching a project that addresses the relative importance of weaponry versus sperm competition traits in influencing male fitness. The giraffe weevils are a fantastic model for selection studies in the wild – please get in touch if you’d like to be among the lucky few to have worked on this beautiful beetle. 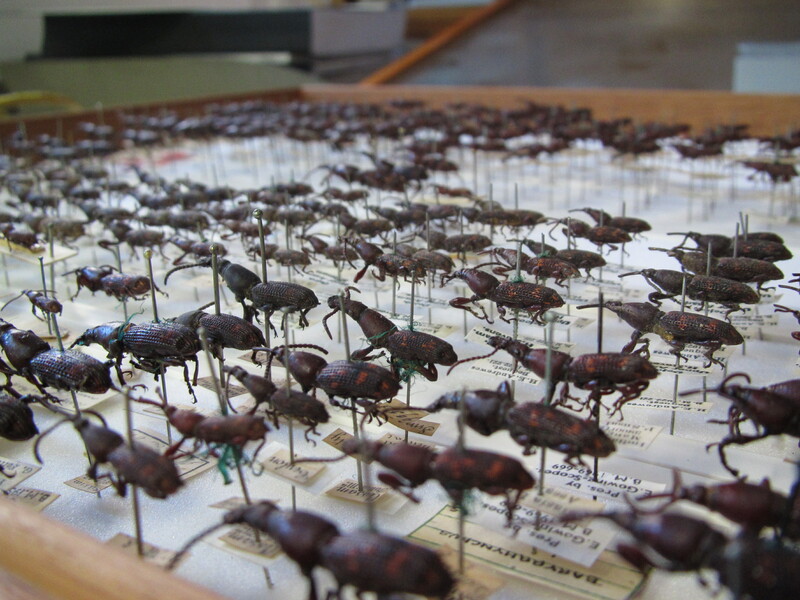 The NZ giraffe weevil is just one of more than 1600 weevils within the brentine subfamily worldwide. 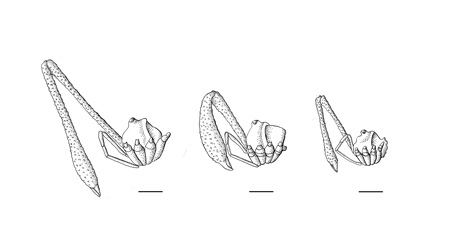 This group shows a enormous level of variation in morphology, with the males of many species displaying exaggerated traits including rostra, mandibles and spiny legs. I am currently working on a worldwide review of exaggerated traits across the brentines using measurements from a large photograph collection that I gathered from numerous museum collections. Specifically I am exploring the relationship between sexual selection and the extent of trait exaggeration using phylogenetic least squares analysis. In 2015 I spent a year in A/P Daiqin Li’s lab as a research fellow working on behavioural ecology in jumping spiders. I was part of a comparative project looking at the evolution of UV and other colours in a group of South East Asian jumping spiders. I also started a project looking at the role of morphology, colour and movement in mimicry for a very beautiful jumping spider, Orsima ichneumon. We have so far described courtship & fighting behaviour in this species and identified a novel nectary guarding behaviour during observations in Malaysia. I’m currently looking for an Honours student interested in working on analyses to figure out the role of the spectacular body colour in Orsima spiders.